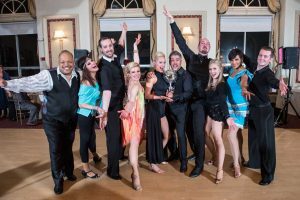 Five local celebrities competed for CRIS Radio’s Mirror Ball Trophy on Saturday (April 28) at the Bond Ballroom in Hartford to raise money for the nonprofit’s radio-reading service for people unable to read due to blindness or other print disabilities. In celebration of CRIS Radio’s (Connecticut Radio Reading Service) 40th anniversary, the nonprofit invited its former dance champions back to compete in an all-star dance-off, the highlight of the evening. WFSB news and travel anchor Nicole Nalepa was the runner up of the contest by just one vote, with Billy Johnstone, a former cast member of the Broadway show “Cats” and host of the Broadway Radio Hour, taking home the CRIS Radio Mirror Ball trophy. Read more.